15 a side European Championship comes around once a year. The winners go on to face their British counterparts. They say winning is a habit. It’s a habit this team and this club have become especially familiar with over the past number of years. Not finishing the day at least in the final of a tournament has come to represent a failure. With our 3rd place finish after a poor day in Luxembourg fresh in the minds, the Championship team descended on Amsterdam intent on making amends. The fire and brimstone was kept relatively in check. Everybody recognised (after Luxembourg and in the trainings in between), that clear heads, with eyes up and open, was going to yield the biggest dividend. We faced off against Amsterdam in the first match of day, albeit 20 minutes late and after some cuddles and kisses between Johnny O’ and Collie Byrne. The warm up wasn’t was it should be and we went pretty much straight from the dressing room to our positions, but we weren’t unnerved. While Amsterdam kicked the first couple of points there was no sense of panic. Heads up, eyes open, ball to the man in the better position, cut out the turnovers and keep possession until we were into a scoring position in the green zone. Basics done well, support running, no panic, reuse, recycle, gaps open up, green zone, bang, point. By half time, there was a clear appreciation of the benefits of this approach. Disregarding our poor prep that morning, it was in that first 15 minutes that every member of the panel bought in to this approach. It was this first 15 minutes that set the tone for the rest of the day. We were defensively solid, cutting out the gaps through the centre which other teams had used effectively against us in Luxembourg. At full time, it was 11 points to 5. Never have we been more satisfied not to rattle the net. There followed a lengthy break to our next game (about 2 hours). This break was spent watching the Shield lads power their way to a famous victory over Luxembourg in their group (and with it, a place in the semi-final) as well as with the usual lads chat regarding the breeding habits of orc type creatures. Despite the break and some alarming mental images, the lads never lost focus. Our remaining two group games against Frankfurt and Eindhoven saw plenty of goals (for us thankfully).Strong running from Ciaran and Naoise caused havoc in opposition defenses, while Keary and Crusher in the full back line were maintaining a vice like grip on proceedings. Conor Mul got his usual stanchion goal which he celebrated with Mario Balotelli type nonchalance while the two Johnny’s were ever calm and composed in possession. As a result of topping our group, the two Belgium GAA teams lined up against each other for a place in the final. After a joint warm up, Olof (banisteoir, maor foirne and doctor) looking like a Clare Island café owner/madman/tour guide took the Shield aside for some final instruction. The Championship team, meanwhile, were reiterating the need to keep the heads up, to recycle, to move the ball and to work it to a shooting position. The game itself had some tasty personal battles. Naoise vs John Louis Sexton esquire made for compelling viewing, if not least for the belting. With each team having 11 players (and no subs) the somewhat better fitness of the Championship team came through in the end. With Scott and Conor Mescall running hard throughout though, it was never easy. With that, a place in final. The very least, this team and this club has come to expect. Facing off once again against Amsterdam, we knew this would be a much different encounter than that of six or seven hours ago.Before the game we stuck to the same principles. Heads up, control possession, no turnovers, work the ball into space, recycle where necessary, wait for gap, bang, over the bar. Calm, composed teamwork. There really is no substitute for it at this level. The first half was once again defined by strong running by Ciaran and Naoise and by solidity in defence. The team is quickly coming to realise that if you have possession then you’re not under pressure. A couple of goals (including an 11th or 12th of the day by Naoise) gave us a nice 8 point buffer at half time. However, playing against a very strong wind in the second half, we knew the need for composure was greatest at this point. And so it proved to be. Amsterdam kicked some lovely scores but by and large they were outside what you would consider to be the shooting zone. If you are restricting the opposition to kicking from here then great. If they put the ball over the bar from here, fair play to them. However, to win games, you really need to be threatening inside and taking the majority of shots from the shooting “green zone”. This is what made the difference on the day. Another goal was added in the second half after strong patient build up play and by the final whistle, we were about nine points to the good. One of the most pleasing aspects of the final performance was that it epitomised the approach we set out from the very beginning of the day. While there are tougher days ahead and opposition teams will have more players available to them, this victory can be the springboard for the rest of the year. Afterwards, Crusher became the first Kilkenny man to win a player of the tournament since Pearse O’Caoimh kicked points for fun in October 2013, wearing a stiletto on one foot and a Adidas predator (with only 2 studs) on the other. Crush had a great day out and was well deserving of the award. Having said that, I feel that anyone of the lads could have won that award such was the teamlike performance throughout the day. This willingness to make the unselfish run, to give that unglamourous pass, to prioritise a block down as much as kicking a point is what shone through in Amsterdam. If we can keep this attitude and keeps our heads in games then we will give ourselves every chance of success and of maintaining that winning feeling. A big thanks to Olof for his work on the line throughout the day as well as to Cluxton and Naoise for playing as floaters and giving it everything. Belgium GAA abu, we’re back baby! The shield team went into the Amsterdam tournament full of confidence after a defiant back against the wall performance in Luxembourg last month. Under the watchful eye of Olaf Gill the team had clearly grown since it had last played, exhibiting an understanding of a team that had clearly played together before. The day started off positive, every ones heads were clearly in the moment, with each man prepared to run him-self into the ground for his team mates – which is exactly what they did. Though we were soon knocked out of our stride – Dusseldorf failed to field a team, meaning the lads had warmed up only to be told there was no game. The reaction of everyone in the team is testament to winning mentality not only of the Shield team but of the whole of Belgium GAA, instead of criticising or complaining the lads kept warm and tuned in by running drills – which clearly helped in the games. Officially our day started against Luxemburg, who had made it the final in their home tournament. Of course we felt the odds were against us but we went out there and did what we had to – play a simple passing game to retain possession. The new found confidence of Big Phil in the middle of the park played a huge role in defeating the odds and recording a confident victory. Ger O’Donoghue led the attacking line with confidence scoring a surprising goal – that in no way was helped by the wind, to place the furnishings on what, in truth, was a comfortable win. After the win over Luxembourg we had booked our place in the semi-final – a huge step up from the drubbing we received in Luxembourg. We faced Den Haag knowing a win would mean we avoided our own championship team and a possible all Belgium Final. Unfortunately this was not meant to be, Den Haag were able to have a longer rest after their match due to Dusseldorf’s absence and the freshness was clear to see. Especially in the middle of the park as no one could keep track of their midfielders bursting through the middle. Despite having our backs against the wall we were not deterred – this team had been christened in circumstances like this just over a month before. Chances were created with defiant attacks from Decy Hillary and beaming runs from Conchur de Barra from half back. With defeat to Den Haag meaning we faced Belgium’s Championship team – despite the odds against us the shield team went out and fought for every ball and every yard, which has become a hallmark of the team. The Championship teams fitness and strength soon eventually shone through with them recording an overly flattering win placing them into the final against Amsterdam. But in typical fashion the shield team did not lie down, creating chances only for Louis Sexton Esquires beautiful solo goal to be disallowed because of Niall Goodwins Oscar award winning acting. Securing third place in Amsterdam showed to every one watching how much the shield team has come along. The tenacity along with the improved understanding is testament to the commitment showed by everyone. I am sure many will agree that if the same intensity is shown through the rest of the season we will continue improve and will be real title contenders in the Pan Euro Shield competition in October. 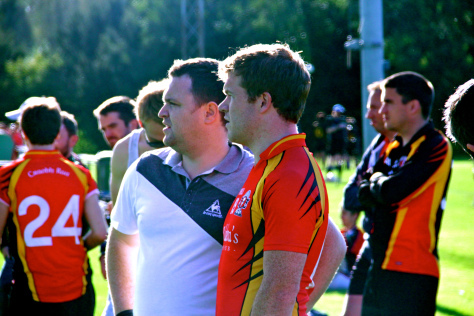 Belgium GAA were the team to represent Europe in the inaugural GAA World Games in Abu Dhabi. Here’s an account of how it went for the men. The season is under way and, if training’s anything to go by, it’s going to be a good one. Colin Byrne, who recently took up office as Chairperson of Belgium GAA, gets us going with his foreword to the season. 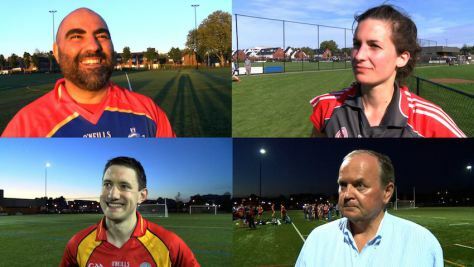 He looks back on how far Belgium GAA has come as a club, the acheivements of last season and forward to the big one, the first ever World GAA Games. I’m going to tell you a story about my family. Its a fairly typical one. I think that all Irish families have family members across the world (American cousins with impossibly straight teeth, who come to Ireland annually and want to spend time in the “homestead” – what is that when its at home? ), but few get the chance to spend time with absolute legends. Like my granddad’s sister Nan. She is as Wexford as Wexford can be, and yet is utterly Birmingham. Its her adopted city, a place that offered a livelihood and a job and a future for her. As a similar annual migrants back ‘home’, we were always lucky enough to coincide with Nan Haycock’s visit. She swims in the sea every single day (its not warm kids), got a second ear piercing for her 95th birthday – announcing with great joy and delight that she had to keep us all guessing, and refuses to join the local *ahem* elderly persons Sunshine Club because, well, she’s just not old. Write her off at your peril she warned. And so, she continues, this utter force of nature, who has spent her who life between Wexford and the Midlands. But she didn’t come ‘home’ this summer. Such is. Wolfe Tones Ladies from Liverpool will take on Belgium Ladies (and shoeless Pete) tomorrow at 2pm in Pairc na hEireann in Birmingham. This is a momentous, epic and historic moment. Honestly. We’re playing championship football, 15-a-side, traversing 3 countries to head to the heart of Britain’s GAA core, to take on a team we’ve never played before, and we’ll finally see what we’re made of. Its a first of of a first of, and they’re rare and special. Capitana Fent, Anay the Awesome and shoeless Pete have been drilling away and working towards this. We’ve all of the hours thundering up and down the pitches in VUB to add up. We’ve the of the kilometres travelled to tournaments the length and breadth of the Benelux, the eggs cracked and cakes baked to fundraise to pay for the pitches we train on week in week out. We’ve the hours of analytics and dissection and plotting and planning to fall back on. The emails, the logistics, the teamer, the endless doodles, we’ve our lives and loves and all of the other things that make people people. But more importantly and most tellingly, we’ve got this wonderful game. A game we love to play and play well. A love that binds. A love that bonds. When settled, confident, we have passages of such beautiful play that it makes me want to and be able to wax lyrical about the way the ball flies, how players move faster than they have any right to, how people jump and field and catch and block balls they have no earthly right (according to the laws of physics) to be able to do so, kicking impossible angles and yet making the seemingly impossible possible. Its almost absurd. And yet it happens. And its what holds players still on the goal line, waiting to see what’s in store next, ready to face down any challengers, and knowing that their body will be the difference, pain or no pain, in a game of millimetres and infinitesimally quick reactions. And what makes this happen? What makes this work? I believe it’s because we love this game, and we also love each other. We choose to spend this time together, creating a home, a team, a history, and a spirit together. There are no better women. There are no better women to stand beside, proud and strong and nervous/excited – that absurdly delicious feeling of shi**ing it a bit before a match – well, its all there. My adopted family, these women I’d do anything for, they’ll be there beside me tomorrow. And for our opposition – they’re just people too. They could be the Nan’s for their families. They could be 2nd, 3rd generation. They could be, gasp, county players! We don’t know their stories. And yet, despite all the unknowns, the knowns, and the known unknowns: we know them. We are them. They’re us. They’re people who love nothing more than chasing each other and a ball around a pitch. What could be more simple? And with that, my love song for Belgium GAA should stop. But know that come tomorrow afternoon, the paradox of being far from home, but with a family that we’ve knit together close to hand, and family members who might never make it home home right beside us, makes for a fairly emotional me. It’s going to be a great day. I can’t wait.